The results are in from the National Commuter Challenge and Toronto came in third place in its category. When we take a closer look at the results though, we can see we didn't have much competition in the "1 million or more" category. Only four other cities that size participated, and we were way, WAY behind second place. So how can Torontonians get in shape for next years competition? You can start stretching your carpool muscles. The city provides few a great resource to get you started. The first carpool aid is the HOV lane. It will allow you to scoot through traffic so long as you have more than yourself in the car. 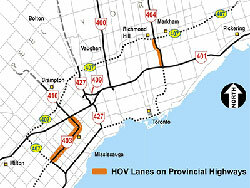 The first HOV lanes were opened 2 years ago, and according to the CBC they are unusually effective. The HOV lane is essential in making carpooling attractive. Without them, you'd be stuck in traffic with a bunch of other people in the car. Now that you know where to carpool, you just need to find that extra body to come along for the ride. Carpool Zone is another handy tool paid for by the city that helps commuters connect. It's free to register, and gives you matches instantly. You can register yourself as a driver, a passenger or both. Erideshare and Craigslist also provide fast search options, but no special system to match you up with anyone. -The TTC exists! Don't be afraid of public transit. Sitting in something gross is rare. -Discuss coffee breaks, holidays and listening preferences before you commit! You don't want to be stuck commuting with someone who listens to Du Hast over and over and over. -A fetus is not a passenger. Neither are blow up dolls, or your dog. -Talk to your insurance company. Sometimes carpooling can affect your rates.